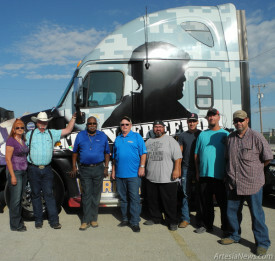 Representatives of Werner Enterprises of Omaha, Neb., paid a visit to Artesia recently to proudly display one of their “Operation: Freedom” trucks while recruiting new drivers. Dave Conkling, Freedom Truck 1 driver, and Jon Jon Everett, Werner Enterprises Southwest regional manager, conducted a recruiting drive June 25 at the Artesia Training Academy. … For the rest of the story, subscribe in print and on the web.